Made with a mixture of our micro-fibre materials. Soft but tough, breathable and hard wearing. Neutral grey Vegetan Fake Suede is used for the main upper part. This is a one piece construction with minimal seams. This material can be left grey and proofed with regular spray-on-type leather/suede proofers. Our clear dubbin can be used to increase the water-resistance though this will darken the grey colour. Other coloured polish can be used eg. black or brown to darken or alter the boots for that personalized touch! 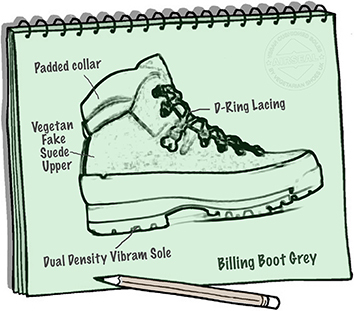 Or you can just put the boots on and wear them as there is a breathable and water-resistant membrane lining between the upper and inner lining the boots. Super soft and lightweight grey microfiber is used on the padded collar. The boots have light-weight insulation throughout and combined with the padded ankle makes a very comfortable and snug feeling boot. The higher tongue at the front matched with the padded ankle and lower cut at the back of the boot gives a good amount of foot freedom to move easily longitudinally whilst still giving support and protection from light knocks from the sides. Rather than the traditional ski-hook type lacing these boots only have ‘D-ring’ lacing. This means the laces are always threaded and ready when in a rush (if you knot the lace ends), but more importantly with no hooks the uppers are lower profile with less chance of things catching on lace-fittings. Made in Italy to our own specs.